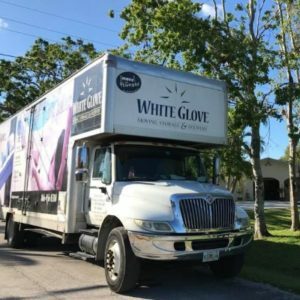 Home > White Glove USA is Here to Save the Day! White Glove USA is Here to Save the Day! It is said that moving is life’s third greatest source of stress, behind only divorce or the death of a loved one. That’ is why White Glove Moving, Storage & Delivery we Make Moving Easy. A: Hiring a professional mover delivers exceptional value on a day that can be otherwise very stressful. Moving can be both emotionally and physically draining, and handling delicate or bulky items with care requires specific moving skills. We highly recommend turning to professionals for this, as you would for many of your households needs such as plumbing and electricity. With 20 years of experience in local moving and long distance moving, our teams of highly trained movers can tackle moves of any size or complexity. We treat every move with the personal care that you would expect from friends and family. However, unlike friends and family, we guarantee satisfaction; schedule a free estimate today by talking to one of our experienced sales professionals at 866-GLOVE10. A: We base an estimate for a local move on an hourly rate, which includes the drive time for each leg of the move: from the moving company to your original home, then to your destination, and back again to the moving company. Pricing for a long distance move is based on a flat rate, fixed price. Once we have taken an inventory of your furniture and other belongings, and identified a timeframe for delivery, we are happy to provide a binding price for your move. If you prefer, we can also price a long distance move by weight. Q: Is moving labor the only moving expense I should expect? A: Moving labor represents the majority of the moving expense. However, you should also budget for packing supplies, such as moving boxes and tape, and for additional valuation (moving coverage) as needed. White Glove takes special precautions with delicate or oversized items, such as flat screen televisions and chandeliers. These items often require a custom wooden crate, which will incur an additional fee. A: With over 100 (combined) years of experience, our sales team prides themselves on providing the most accurate moving estimates in the industry. Our proprietary sales system ensures that we work closely with every customer to fully understand his/her moving needs and to provide a moving estimate that reflects those needs. Be sure to offer as much information as possible at the time of the estimate – this includes reviewing the inventory for accuracy. Neglecting to mention additional items, or difficult areas of access, at the time of the moving estimate almost always results in unexpected costs for the customer. A: As with other service industries, you may wish to thank your movers for a job well done by offering a gratuity. While the movers do not expect a set amount, we suggest a tip based on your satisfaction with your crew and the overall move; with a broad guideline of $4-6 per man, per hour. If you feel that your movers went above and beyond in their efforts, you may want to increase the amount accordingly. Q: Is valuation (moving insurance) necessary? A: Although White Glove Moving will take every necessary precaution on your move, unexpected damage can occur and it is important to make sure that your possessions are protected. We are able to offer valuation (moving insurance) to our customers at a very fair price due to the very low number of claims we file. A: We recommend scheduling your move as far in advance as you can. The farther out you can plan your move, the greater the availability you will have in choosing a date and time that is convenient for you. A general rule of thumb is to contact us no later than two weeks in advance of your desired move date. We realize advance planning is not always possible, and do our best to accommodate last minute customers as well. A: Focus on packing, instead of moving. Smaller items and moving boxes can be moved very quickly by professional movers. Don’t spend time trying to move these items yourself. Rather, focus on packing boxes, so when the movers arrive, you are 100% ready. For more information on packing and packing supplies check out our tips in the packet provided free at each estimate. Q: I have some items that I’d like to keep, but they won’t fit in my new home. Should I store them? A: Yes! 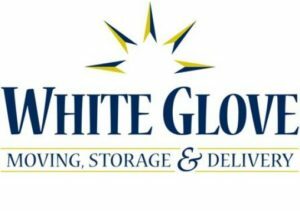 White Glove Moving, Storage, & Delivery offers full service storage facilities in addition to our high quality moving services. If your items do not fit in your new home, but you are only living there only for a finite period and then have plans to move to a larger home or you would like to hold on to the items for family and friends, use of our storage facilities is a convenient, safe option. Ask your move coordinator for more detail on this service offering both short and long term solutions. A: Choose a simple labeling system (i.e. MBR for Master Bedroom) and make sure that all of your boxes are clearly marked. Boxes should be labeled on the top and 3 sides. Your movers will work closely with you at the destination to make sure everything ends up where you want it. A: It is generally fine to leave your clothing in your dresser drawers during the move. Be sure to remove anything from the drawers than may roll around or shift during transport, as this can cause damage. If the dresser is particularly large (a triple dresser or part of a large armoire), it is best to at least partially empty it. A: You should make certain that your dishwasher, microwave, refrigerator, washing machine, and dryer are empty. Additionally, movers are not trained electricians or plumbers – you need to arrange for the appropriate professional to disconnect your washer, lighting/chandeliers, and refrigerator from any electric and/or water connection. Most importantly, movers are not licensed to disconnect gas, which power many dryers and ovens. A: Such items can be moved on local moves if properly packed/prepared, but we cannot guarantee the safe transport of live plants, which can be traumatized by motion or temperature extremes inside the moving truck. We cannot transport live plants on long distance moves. A: White Glove, as well as all Licensed Movers, will not move hazardous or combustible items such as propane tanks, firearms, paint, and aerosols, as the temperature in the truck could cause these items to explode or ignite. A: When the movers first arrive, they will do a walk-through of your current home, confirming which items are going and which are not. A: If your moving day is rapidly approaching and it becomes clear that you will not be fully packed, it is critical that you inform your move coordinator as soon as possible. He/she can work with you to make the best possible “plan b” for packing. This may mean having the movers finish your packing or, if you have the flexibility and we have the availability, pushing back your moving day in order to allow more time to pack. If you have a only a small quantity of items left to pack, your movers can often complete this on moving day; however, it is important to understand that this will add time to the job and, therefore, add to the total cost of the move. A: Absolutely. When we deliver your items to your new home the movers will work closely with you to make sure all furniture and boxes arrive in the correct rooms, and we are happy to arrange and rearrange the furniture exactly as you would like it. A: For your own peace of mind, you may want to consider moving jewelry and other small valuables yourself in your personal vehicle. As for larger items – such as art, antiques, musical instruments, special collections, or other items of great personal meaning and value – point these items out to your movers at the start of moving day so that they can take the necessary steps to ensure for their proper care. A: On moving day, you should let the professional movers handle the job entirely – they are highly trained and the best suited to carry the weight and negotiate the loading of the truck. Generally speaking, having non-professionals work alongside the movers slows things down and costs you more in the long run. Your friends and family can be most helpful in preparing for the move – packing moving boxes or caring for your pets or children. A: Yes. As professional interstate movers our team and equipment is prepared to move during rain, sleet, or snow. They come equipped with supplies to keep your belongings safe from the elements. However, in order to keep costs down, we recommend that you shovel, rake, or otherwise clear the access ways in preparation for their arrival.